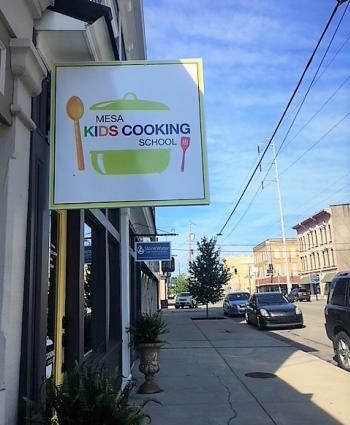 In a brightly lit shop with sunny yellow walls on Main Street in New Albany, the MESA Kids Cooking School opened its doors in July with weekly summer camps for kids ages 7-14. Each week has a different theme, and the kids that participate build a book of recipes they get to keep. When I visited the shop, the theme was baking around the world and I came on France day. 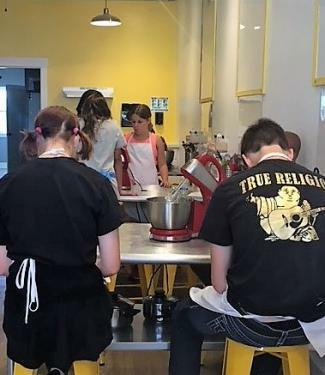 The students were mixing meringue for macarons. Seven students were working at the five stainless-steel prep stations. Each station is equipped with the utensils necessary: pots, a convertible stand mixer, spatulas and whisks. Instrumental versions of pop hits played in the background as the kids worked. The students work collaboratively on most of the project, but each has the chance to try his or her hand at whatever skills are being taught. 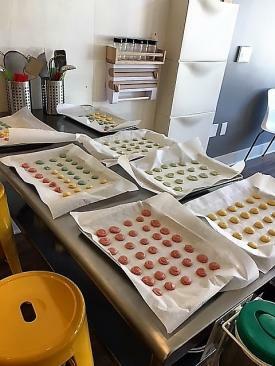 After creating the meringue, the students piped their cookies onto parchment-lined cookie sheets. They giggled and helped each other complete the task. Ysha Bass leads the students in the process and walks to each group, helping as questions arise.“Be sure to lift up as you pipe your batter onto the parchment,” she says. Bass and her husband Bobby founded the adult concept that spawned MESA Kids. MESA, A Collaborative Kitchen opened in 2017. The adult version invites chefs from Louisville and southern Indiana to cook and teach guests about food. Each dinner is themed and paired with spirits. The kids’ concept came as an outgrowth of the collaborative kitchen. Occasionally, they hosted youth classes and found them very popular. MESA Kids hired Chef Liz Martino to be the director of the school. She sets the classes and gathers all ingredients for the students. Martino is also the executive chef and chief of operations at Adrienne’s Bakery Café. 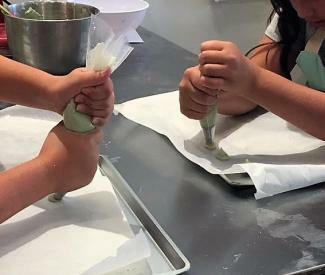 After piping their cookie dough in neat rows onto the parchment sheets, the kids clean their stations and prepare the cookie filling. They have enjoyed learning about the flavors they are creating. Once school starts, MESA Kids will begin an after-school program. 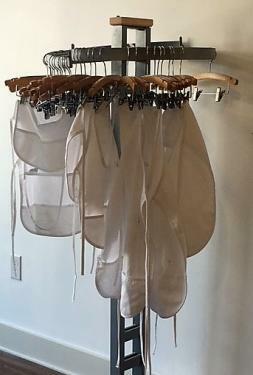 They will offer two class times: 4-5:30 p.m. and 6:30-8 p.m.
MESA Kids also offers weekend workshops and birthday party packages. Some of the upcoming August events are a "Mommy and Me" class with Chef Mallory, who owns Strong Roots Kitchen in Louisville. A honey class with New Albany Apiary and a chocolate class with Erica Chavez of Cellar Door Chocolates in Louisville will be offered. To find a class for your child, check the MESA Kids Cooking School website or their Facebook page. View the MESA, A Collaborative Kitchen page on our site to learn more about its experiential dining events.